Who is ready for Super Bowl Sunday? This Jalapeño Popper Football Cheese Ball will be all the rage at your football party! 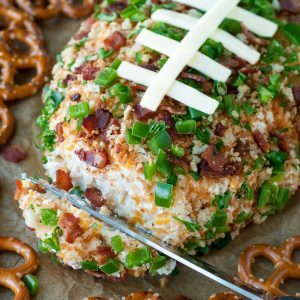 This Jalapeño Popper Football Cheese Ball is sure to make a touchdown at your next game day party! In a medium bowl, combine softened cream cheese, cheddar, pickled jalapeño, garlic powder, salt and around 2-3 TBSP chopped green onion. Using a hand mixer or a fork and some elbow grease (my method of choice), mix well. Use a silicone spatula to scoop out the cheese mixture and shape into a ball with your hands. Place on a sheet of parchment paper or a cutting board and flatten the top of the ball, pinching and shaping it into a football. You'll want to press down on the middle and sort of pinch the sides while you press it into an edible football. I promise it's super duper easy, relive those play dough days and have fun with it! If cheese ball is too soft, cover with plastic and pop it in the fridge for 15-60 min. Mine was still firm yet soft enough to coat with toppings after 15 minutes so I went with it. While your cheese ball chills, chop the bacon into pieces and cook until crispy in a hot pan or skillet. Remove bacon from pan and wipe clean, leaving a teeny bit of the bacon grease behind. Add your panko and lightly toast it, stirring frequently for about a minute or two until golden. Remove the seeds, veins, and stem from your jalapeño and finely chop/mince. Sprinkle/cover your cheese ball with panko, the remaining green onion, parsley, fresh jalapeño, and bacon and press firmly into the cheeseball to coat. For the laces, snag a slice of mozzarella cheese (or any cheese really!) and use a sharp knife to cut it into thin slices. Cut one long slice for the center of the football and smaller slices for the laces. Place the long slice horizontally along the center of the football, then arrange the small slices horizontally on top. Again, super simple and you can basically use any cheese you'd like, if needed! Add all your favorite dippers from the list above and dig in! Leftovers taste deeeeeelicious spread on pretty much everything in sight the following day, especially buttery whole grain ritz crackers! Need to soften your cream cheese in a hurry? Microwave for 30 seconds on high. As written, this cheese ball is pretty mild, medium at most. For a spicier appetizer, feel free to up the jalapeño content and even employ a little hot sauce or red pepper flakes into the cheese mixture. Taste as you go and customize the heat to your preference. The parsley is 100% optional if you don't have any handy. See post below for GF and Vegetarian swaps! Serve with assorted pretzels, veggies, apple slices, and crackers for dunking/scooping/spreading/faceplanting.